may see the infertility as their greatest concern, oftentimes as a reason to abort given a prenatal gene test before birth. Further obvious difficulties are learning difficulties, less interest in the interaction with peers and partly bullying during school because of a feminine body shape and increast breast tissue development as well as behaviorial issues. tend to equate the karyotype 47,XXY and Klinefelter’s syndrom, and as a result a lack of testosterone which needs to be treated. The hormone deficit is in the foreground and explains most of the effects like shyness, depression, difficulties with peers as well as osteoporose and metabolic syndrome. They often assume that XXY identify themselves as men and want to be masculinized by testosterone supplement therapy. are often unfamilar with the effects of Klinefelter’s syndrome and prefer a look at wikipedia. However wikipedia and other sites do not always inform about the genetic origin and its large spectrum of different effects. Main risk is that they assume all effects were present and they do not check its validity for each individual XXY person. Moreover, they will likely think testosterone deficit is the core symptom and hormone replacement treatment will be sufficient to treat anything negative in the person, or which is interpreted as negative (not every derivation from the norm is necessarily a deficit). If deficits are present, they may be compensated by strengths which may be relevant for employers as well but talking about Klinefelter’s syndrome implies talking about deficits and disabilities. XXY is more than a deficit – it’s just a different way of being. My picture of Klinefelter Syndrome changed over the recent eleven months quite a lot, and now I’m not even sure what it is exactly and which associations are given between different causes and effects. I try to separate because I think it’s for nothing to stuff as much symptoms as possible into the umbrella Klinefelter syndrome or XXY, and XXY individuals have only a few but not all of these symptoms. Another XXY person will not identify with these symptoms and might be afraid of to be stigmatized for something he actually has not. Please keep in mind I’m not a doctor and I can’t guarantee there is a state of latest research different to my current knowledge. 2. Klinefelter’s syndrom is the description of physical symptoms in nine (9!) men by the first report of Harry Klinefelter in 1942. 3. Hypogonadism (low testosterone values) are present in nearly all XXY people as a result of the second X chromosome. Which genes are causing hypogonadism? Still unknown. 5. Partly genetic, partly hormonal effects produce a female-like fat/muscle distribution and different body composit as well as enhanced risk for osteoporosis and metabolic syndrom. 7. 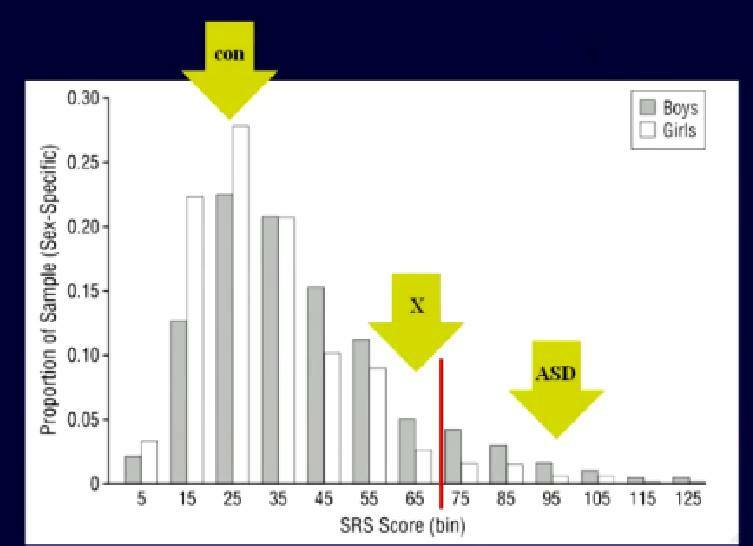 Deficits of executive functions and sensory integration disorder play a major role in psychiatric conditions like ADHD, autism and schizophrenia whereas Klinefelter’s syndrom is mainly seen in connection with testosterone deficits. 8. Testosterone deficit does not evolve before puberty, with exception of the missing mini-puberty in the first three months after birth (not every XXY is missing that period when testosterone levels rise to adulthood levels for a very short time). Some adults even have normal testosterone values (who defines normal? from a XY perspective? Is XY also valid for XXY? What is normal for us?). For intersexual and female XXY, testosterone deficit may even be the wrong term. They just have low testosterone values and may start estrogen therapy later. There are also XXY males who agree with their female characteristics and traits and do not consider low testosterone values as a deficit. They would even put up with health issues due to the low values instead of losing their identity. 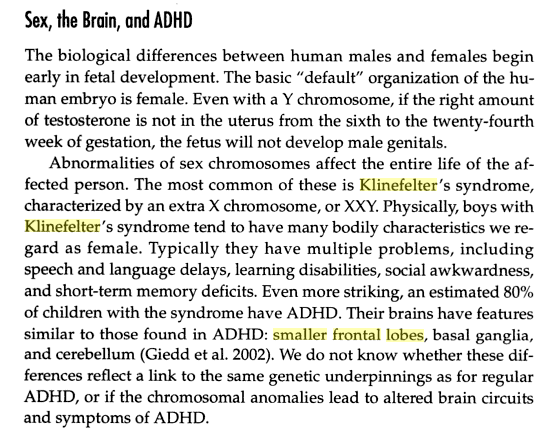 If neither gender nor identity argue for a testosterone deficit, the XXY person should not be considered to have Klinefelter’s syndrome. 9. Deficits in language skills, verbal expression and in communication in general are often compensated by thinking in pictures or patterns as well as enhanced detail perception. What’s the difference between my approach and the common medical approach? I do not start with a testosterone deficit but with a genetic condition (as a neutral judgement, without moral evaluation). All further effects are the consequence of a genetic condition but not of a syndrome encompassing different causes – both genetics AND hormones. Overview: The list above is not complete but should serve as a rough simplification of my way of thinking about XXY. The term Klinefelter’s syndrom is removed from that overview because it’s only a part of all these circles and just a cut-set in the list. There is no case with a 100 % concurrence as even testosterone deficit is not the accurate term for female XXY.In a strict sense, the listed characteristics are part of the diversity of the genetic condition XXY which may also present in all people with normal chromosome numbers.The additional X only enhances the prevalence for these characteristics. I have lower testosterone values, a different metabolism, a different perception (sensory gating disorder) and another way of thinking. They are the result of my genetic condition. The genetic condition already comprises the hormonal effects which will appear differently in individual XXY persons.